Today I got up at a good time, got a great start on my class preparation, did school with Jasper, and got some other stuff done before deciding to go ahead and get the DVD we would be watching in class this afternoon and set it up. My class just finished reading the Jane Austen novel Persuasion, and I thought they would enjoy seeing the movie. Well, guess what? I went to the Jane Austen section of our DVD shelves and there was no Persuasion! I KNOW I own it and have watched it before. I recently organized my DVDs and could have sworn that it was right there where it belonged. By now it was almost lunchtime, and my class starts at 2:00. I spent an hour and a half looking for the DVD. Jasper helped me look. We did not find it. Jasper suggested Netflix. They don’t carry it. Then Lucy showed up and suggested Amazon’s instant video streaming. Now, I have Amazon Prime but have never, ever used the video service and had no idea how to go about it. Fortunately I have offspring who know more than me. Lucy knew that Mercy’s Amazon account was already set up for our TV, so all we had to do was text Mercy and ask her for her PIN. Just before my first student arrived, we were in business! Yay for technology! I’m just waiting for the DVD to show up sometime in the next day or two. Because you know it’s going to. Unfortunately, I was feeling rather under the weather all afternoon–nothing serious; I think it was just something I ate. I did enjoy the movie and got some knitting done. I know I said my next knitting project would be fun, but it isn’t. I am finishing a project that I started years ago because my guilt about it has become unbearable. When it is finally done, I WILL start a fun project! While we were still having class, Spencer got off work and then took off in his car to go fetch his new puppy. 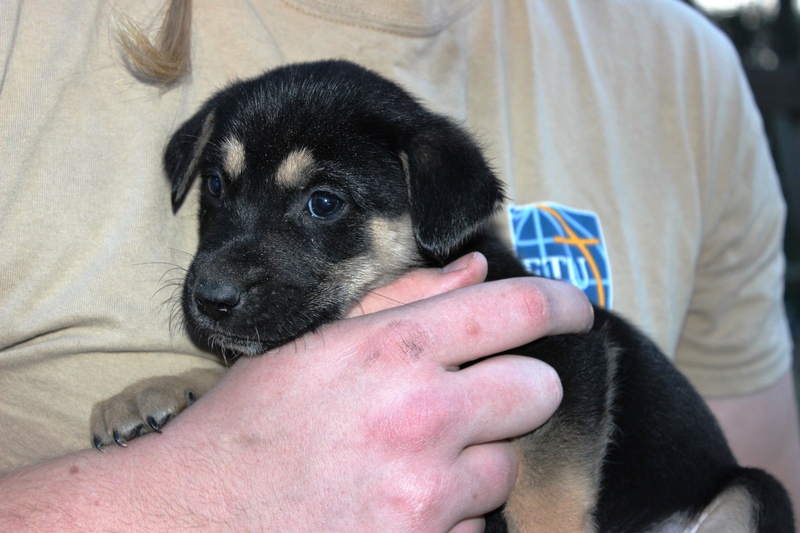 There was a lot of begging about this puppy. What convinced me to give in was the fact that Captain Jack is so lonely. I think he would be less likely to keep trying to get over the fence to play with the neighbors’ dogs if he had a little friend here in our yard. Rudi is half Labrador and half German shepherd. He is tiny and adorable and Captain Jack is beyond thrilled. He licked Rudi so much the poor little puppy was soaking wet! Well, I don’t feel like there is much to say about today. We did school. I took Jasper to piano. I went to the fabric store and got more fabric for the orphanage clothes. All I need now is time to sew. It was very warm and muggy today. I don’t like warm and muggy at any time, but especially not in January. Where did my glorious winter go? I know some of you want to know what I mean by “warm.” I mean 80 degrees (26.7 for you metric folks). Ugggh. I consider myself a good communicator. Words are my thing. I write hundreds of thousands of words a year, and I say quite a few of them out loud too. In fact you may have trouble shutting me up. Most of the time, people understand what I am trying to say. In fact, many people actually think I am eloquent at least some of the time. They not only understand the facts I am trying to convey, but the emotions behind them. There are a few “mystery” people in my life, however, that I don’t communicate well with, no matter how hard I try. For years, I thought that I somehow was choosing my words poorly, but now I think it’s deeper than that. It’s like we know all the same words, but for them, those words mean different things when I say them. Somehow, when I say something to these “mystery” people, something happens to the words between my mouth and their ears, and they receive a completely different meaning. When I say (to anyone), “Would you like a cup of tea?” I mean what I say. I am offering you a hot beverage made by pouring boiling water over some tea leaves. 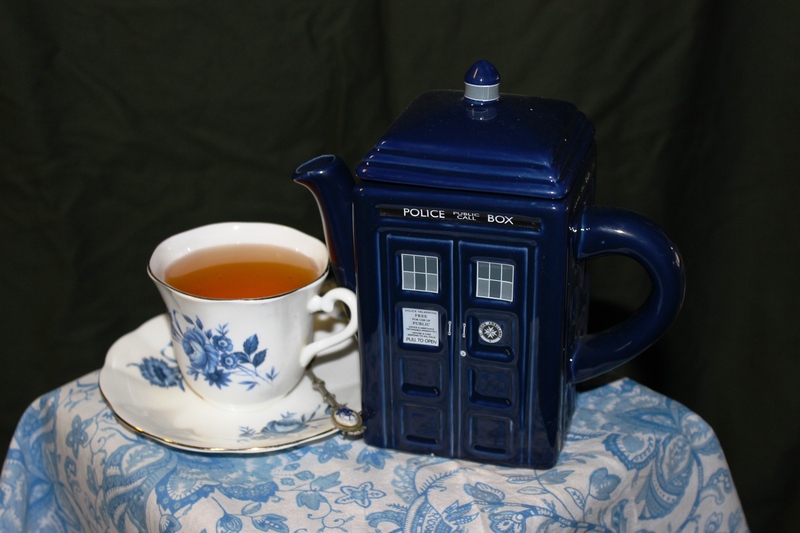 Furthermore, I am offering you this particular beverage because I love tea and I love to share it with others. I have no hidden agenda. Recently, I have been given a tiny glimpse of insight into what must be going on here with this handful of people who misunderstand, misinterpret, and misjudge literally everything I say to them. They don’t just dislike me. They don’t just find me irritating or annoying. They truly believe that I am a bad and contemptible person. This, I think, is the key to why they consistently misunderstand me. If you think I’m an evil person, not just sometimes but all the time, then you are going to make certain assumptions about everything I say and do. If you believe I’m truly despicable, all the time, then you are going to assume every word I say has some sort of evil intent behind it. Because you believe I’m a contemptible beast, you can never believe that I would be kind or generous to anyone–least of all you. So whatever I say to you, you will receive it as an offense, because you know how bad I am and you can’t believe that someone as bad as me could ever say or do a single good thing. Your perception will twist even a sincere compliment from me into some sort of savage insult. If I am aware of my offence, apologizing will do no good either. When I discover that I have offended one of these people, of course the first thing I do is express my sincere sorrow and distress at having offended them. However, since they believe I am evil, they cannot accept my apology because they do not believe I mean it. They assume I am apologizing because of some ulterior motive that will end up being offensive to them, just like everything else I say and do. I can’t tell you how discouraging this is for me. I can’t fix it. I don’t know how to fight it. I cannot win. Experience tells me that even years of kindness and friendly overtures will do nothing to change the opinion of someone who has already decided I am a wretched and reprehensible beast. Their good opinion, once lost, is lost forever. Some of you are thinking, well, if those people have such a low opinion of you they shouldn’t be in your life. You’re better off without them. Of course there are some truly toxic people that we need to walk away from. However, I think we all know that we don’t necessarily get to choose who is and isn’t a part of our lives, and in each of these cases, I truly love and care about the other person despite their obvious revulsion toward me. So why am I going on about this to you, my unsuspecting readers? I have been mulling this phenomenon over for a long time now (decades), and what I find myself wondering is this: Have I been guilty of misjudging others as some have misjudged me? Is there someone in my life whom I believe is irredeemably bad? Do I judge that person’s speech and behavior by a completely different standard because I assume they are bad, and everything a bad person says and does must be bad? I hope not. I’ve been wracking my poor middle-aged brain in an effort to discover if I have been guilty of this type of behavior. Sure, there are people who rub me the wrong way and people who just really annoy me sometimes, but I hope that I am willing to give others a second chance even if they’ve done something really hurtful. I’m not talking about people who hurt me on purpose, or people who realized they hurt me and were sorry for it. I’m talking about people who may have hurt me without realizing it, and who will never realize it. Forgiveness is a challenge at times, I know. It’s like we get some kind of internal payoff for hanging on to the hurt and pain, and we don’t want to let it go. Several times I’ve heard someone say that forgiveness means giving up your right to hurt the other person back. As I’ve pondered this idea, though, I don’t think it goes far enough. Based on my understanding of the Bible’s teachings, I would have to say that true forgiveness means that you choose not to retaliate and to wipe the slate clean, obviously–but it also means that you leave yourself open and vulnerable to being hurt again by that same person in that same way, and to still not hold it against them. That takes the kind of courage I often lack. When I find myself faced with someone who has hurt me in the past, I hope I can leave that hurt behind me and take their words at face value. If they offer me a cup of tea, I hope I can gratefully accept it. Today was a very full day by my standards. I was up and working on school with Jasper this morning while still trying to work on music and make a massive batch of “relish” for the Zambian food we got volunteered to make for an event on campus tonight. I also booked a flight for Walter. As an early birthday present for both him and his mom, we are sending him to Atlanta to visit her and help her out with any jobs she has around the house. Although I got to see his mother about a year ago when we were in Atlanta for a wedding, Walter has not seen her since Mary’s wedding–over a year and a half ago. I found him a round-trip ticket for about $80! Of course, once you add insurance and a checked bag fee, the price increases, but it is still a pretty good deal. I was frantically writing down chords up until 5 minutes before I left for my autoharp lesson. It was a warm day–too warm for my taste–but the 90 minute drive was beautiful and I was so glad to see my teacher again. I realized when I left what a bad student I am. Instead of her telling me what to practice, I tell her what I am working on and she tries to help me. I really need to work harder at learning what she wants to teach me! From my lesson I drove back down into town for my critique group meeting. By that time I had drained my water bottle, so I went to the drinking fountain in the library to refill it. I did refill it, but somehow I also managed to dribble a large quantity of water down the front of my skirt! So classy-looking for critique group! I am so thankful for my critique partners and the effort they put into helping me become a better writer. After that was our regular writers’ meeting, by the end of which I was quite ready to return home. Eight hours of being out and about is quite enough for me. The Zambian food was a big hit, I hear, and there is some left over which is wonderful news for this household! Despite the fact that it was Monday, today didn’t go too badly. Sure, I had to prepare to teach two classes, but thank goodness I wasn’t as exhausted as I was last week. I did school with Jasper and even ran an errand this morning. My classes went fairly well. My middle school class is very interactive and most of the time I don’t mind at all. My essay class is the opposite. Every question I ask is met with dead silence! Clearly, my students believe that something horrific will happen to them if they speak up and don’t say the “right” thing! Honestly, I’m not really that mean. Two important things happened in the last few days. First of all, Hershey’s bullied a British import company into agreeing not to import British-made Cadbury chocolate from now on. I am horrified and angry, and so are a lot of other people. I will hold my tongue in case you are a Hershey’s fan, but I also really hope that the protests are loud enough to force Hershey’s to back down on this one. If they don’t, my Canadian friends might be commandeered to buy and ship chocolate on certain special occasions . . . The second thing that happened was a serendipitous connection courtesy of Facebook. I recently joined a Facebook group that is focused on Zambia. I don’t read all the posts, but there are some nice photos, etc. Most of the members seem to be either older than me or a LOT younger. A couple of days ago I saw a post and the name of the person who posted was the name of someone I went to school with at Sakeji–someone I hadn’t heard anything about for decades. So, I commented on his post and asked if he was the guy I remembered. (I had no idea how common his name might be.) Ta da! He answered in the affirmative! I had barely known him at school, but I had been friends with his sister, so I commented again, mentioning the fact that I had fond memories of his sister. He responded with a photo of her and her email address. I was so tickled! Not so much for myself, but for a mutual friend who was much closer to the sister than I was. I’m hoping I can put them in touch with each other. Sometimes, I really love technology. Yes, I know that is the answer to life, the universe, and everything, but it has other significance too. Forty-two is the number of cloaks I have made since I made the first two for Flynn and Lina some twelve years ago. I have at least four more on my list too! Number forty-two was Jasper’s belated Christmas present. 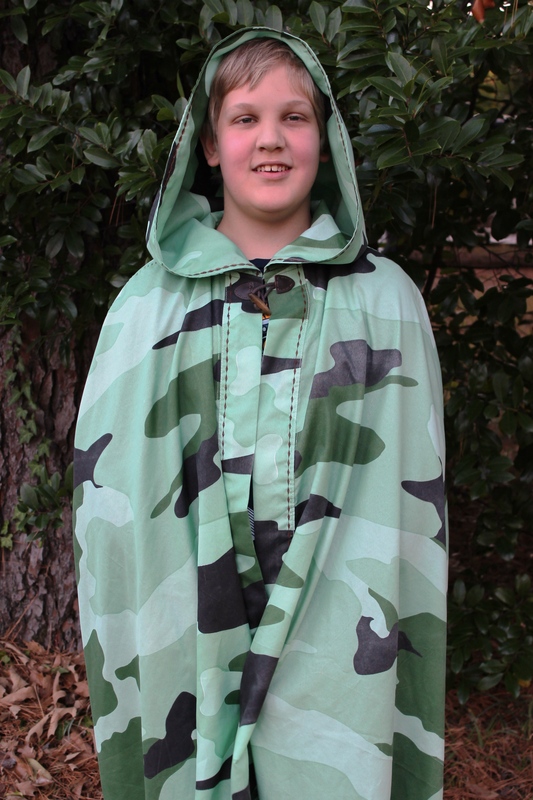 He is obsessed with camouflage, so I made him a camo cloak. He is happy with it. When he gets taller, he will need a new one. This one is actually a bit of a disappointment to me. 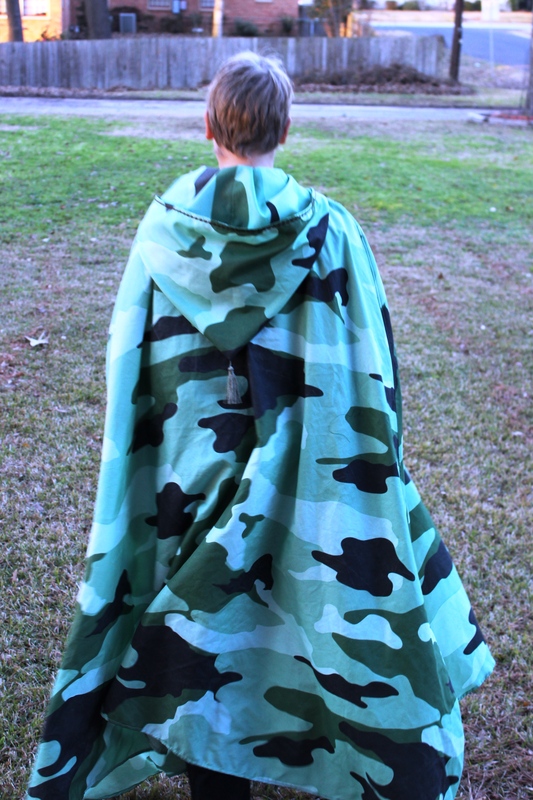 I could not afford the nice camo fabric at the fabric store, so, since I knew this would not be a long-term cloak, I immediately thought of using sheet material, as I have so many times before. I could not find any camo sheets locally, so I looked around online until I found a great sale on a set of camo sheets. I was a little leery because they were microfiber rather than a cotton blend, but I have seen plenty of microfiber that did a pretty good cotton imitation, so I figured that’s what I was getting. I never even pulled the sheets out of the packaging until late November, only to find that the microfiber is very thin and flimsy. I had to use it anyway, but I’ll never buy a synthetic again unless I get to see it in person first! Most of today was spent on a task I thoroughly detest. Sure, I dislike cutting out fabric. Not enough to trust anyone else to do it for me (well, almost anyone), but I really don’t like it. However, I loathe tracing patterns even more. I have several patterns for the charity sewing project that I have to trace so that I can make each one in multiple sizes. One pattern in particular I bought online because it has been discontinued. It is perfect for this project but since there isn’t even a hope of getting another copy, I carefully traced off all four sizes. Another pattern I traced three sizes of. It is such tedious and meticulous work. All day I kept telling myself, if I just get all this tracing done I can still have time to cut out some cute dresses and maybe sew a couple. Nope. I did cut out one dress, as my family sat around tapping their feet and waiting for me to clear off the table so they could have supper. I really hope that tomorrow I get to do some actual sewing! Today, the sun actually came out. I love rain, I really do, but I also like seeing sunshine after a couple of days without it. We did school. Late in the morning, we got a delivery of tamales. Our neighbors were selling them to raise money for their mission trip to India. We heated them up for lunch and they were delicious! We almost never get tamales so that was a real treat. I serged and prewashed all the fabric that I have earmarked for the charity sewing project. I had hoped to cut some dresses out as well, but a few hours of nausea kind of derailed that plan. We had pizza for dinner. (Well, everyone except me. I hate having to make two kinds of pizza so most of the time I just go without.) Mercy and Jasper both had a friend over. Afterwards, I kind of wondered what Jasper’s friend must have thought. I know that most families with young kids eat earlier than we do–and we once did too. Years ago, I remember Lina spending time at a friend’s house and coming home starving at 9:00 because they hadn’t had supper yet. I was appalled. Now, we almost never eat before 7:00 p.m. because of my husband’s evening work schedule. We eat when he gets back, which is usually between 7:00 and 7:30. We are so used to this routine that it never occurred to me to warn Jasper’s friend that he’d be eating later than he is used to! All afternoon and evening Nate and Colby were on my mind. There was a memorial service for their sweet baby Everly tonight, and there will be another one tomorrow in the area that Colby is from. I hope that they felt the love and support of everyone there and of everyone who has been praying for them from all over the country. I finished my knitting project. It served the purpose of using up two skeins of chenille yarn that I had been given. I hate knitting with chenille with a deep and abiding hatred, so I have not enjoyed this project. Whatever I make next, I want it to be something fun! It started raining last night and it really hasn’t stopped since. After several sunny days with balmy temperatures, today seemed downright gloomy what with the rain and the much cooler temperatures. Jasper had a really hard time getting going on school, and so did his teacher! I couldn’t put it off though, because I had a class to teach this afternoon. Normally, I have a total of five students in my high school class. Today I had two, and one of them was Lucy. At this time of year, so many are sick. If I had known that three of my students wouldn’t be coming, I probably would have canceled the class. As it was, I let them out a little early. I also grimly soldiered on in my effort to finish a knitting project that has sucked up way too much of my time and effort for what I’m going to get out of it. And I cut out another little dress pattern. On days like today, I really wish we had a fireplace. So, the whole charity sewing project is really taking off, and people have been asking about patterns, especially people who aren’t really confident seamstresses. I don’t want to waste all this enthusiasm, so this morning I got Jasper going on school and then went to the fabric store to scout for suitable patterns. There are actually a lot of considerations that make finding suitable patterns a little difficult, but I was able to find at least a few in the catalogs of all three main pattern companies. And since McCalls patterns are on sale at the moment, I picked up a few for myself. I also scored some beautiful floral denim for over 80% off the original price. I took Jasper to his piano lesson right after lunch. We had to move it up this week because of my appointment at the endodontist this afternoon. My gum had swelled up and got infected again over the weekend, so I felt I should have him check it out. Turns out that the swelling was normal and that I took care of it correctly so nothing further needed to be done. Also, my visit didn’t cost anything. Whew! After I took Lucy and her friend Martha to youth group, I took Jasper on up to Target because there was a Lego set that he would die without and he had enough money to buy it. He was so happy to get it! Then it was home to sit and cut out some paper pattern pieces. I’ve got quite a bit more of that to do before I am ready to cut out some adorable little dresses. 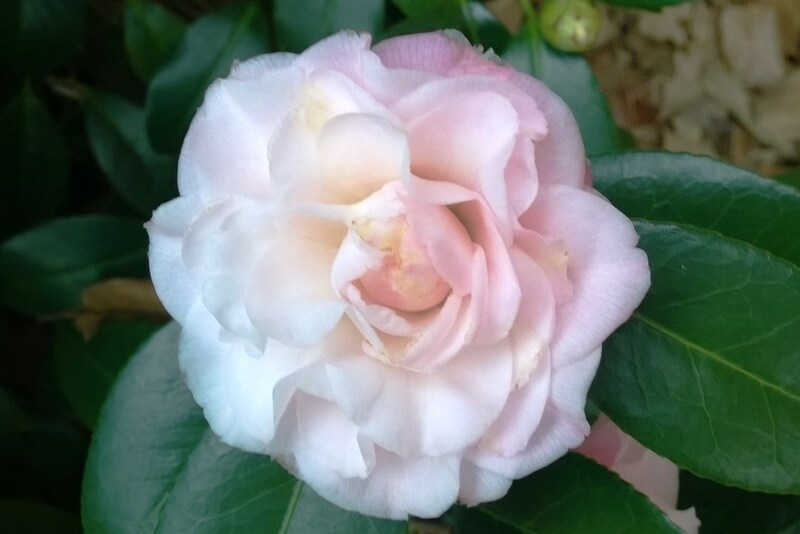 Our camellia is blooming. I like to think she is trying to set a good example for that deadbeat Miss Wisteria.